The Brexit vote unleashed the volatility hydra across all asset classes globally. GBP gyrated like a Vegas striper once the voting results were released. The chart above shows the 10-day realised Bitcoin and GBPUSD volatility. 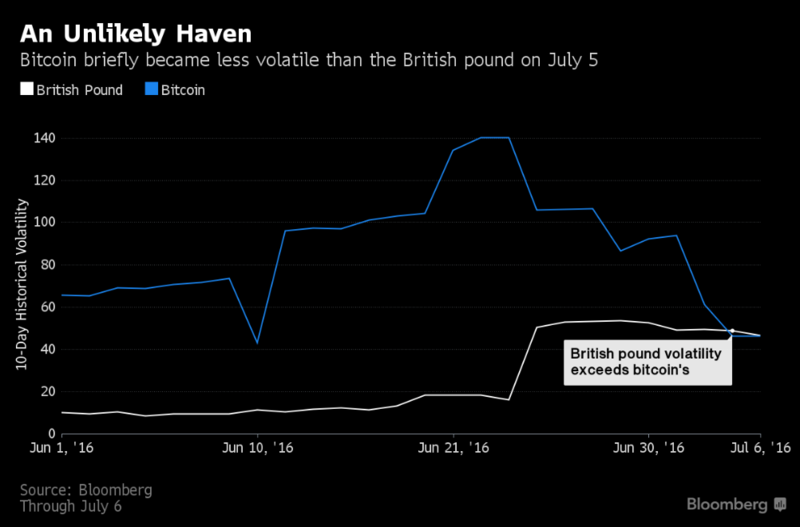 On July 5th the volatility of the Pound was greater than Bitcoin’s. One of the biggest criticisms of Bitcoin is that it is too volatile to be used in commerce. Many fiat currencies experience episodes of extreme price volatility. When this happens, trade denominated in those currencies does not halt. Businesses that engage in cross-border payments make use of financial derivatives to hedge their currency risks. Volatility can make these hedges more expensive, but trade can still commence. The Bitcoin derivatives market is still in its infancy, but over time the hedging tools available will multiply and the liquidity in these products will grow. Of course, BitMEX aims to be the largest platform for such products. Those who use Bitcoin as a cheaper means of money transfer are really only exposed to price volatility between the time payment is sent and goods are received. In the case of those using Bitcoin as a better way to move between fiat currencies, this risk is limited to minutes. As central bankers lose their ability to keep a lid on market volatility, expect more previously “stable” fiat currencies to pump and dump just like Bitcoin.